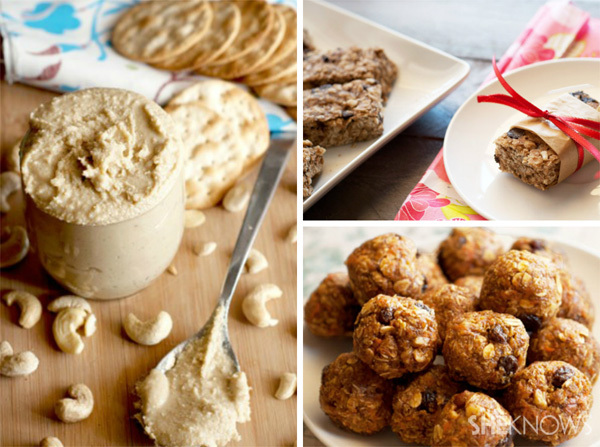 With these 20 simple ideas and easy recipes, you can keep snacking guilt-free for the new year. Planning out meals, especially snacks, is a wonderful way to keep your healthy eating habits on track and the junk food away. Often, when we get hungry we tend to grab unhealthy snacks like chips, candy or soda rather than fresh produce or other whole foods. I keep these healthy snacks in our home along with a few easy-to-prepare dishes so we’re never reaching for the junk when hunger strikes. Homemade nut butters — You can spread nut butters like this maple vanilla cashew butter on whole grain toast or apple slices. Try portioning out servings in small airtight containers so you don’t overindulge. Dried fruit and nut mixes — Dried goods are a great portable snack. I recommend portioning out single servings into zip-closed bags and storing them in your pantry. Keep a bag in your purse, lunchbox or car for quick snacking. Homemade granola bars — Sweet, salty, crispy or chewy, everyone loves a granola bar. Try making them at home so you know exactly what ingredients are going into the recipe. Once you experiment with flavors you like, you will never buy those prepackaged bars again. No-bake carrot cake bites — If you’re craving something sweet, try making these delicious guilt-free treats. They taste just like carrot cake minus the sugar, fat and high calories. Peanut butter with fruit or celery — In an airtight container, place sliced apples and celery sticks along with 2 tablespoons of all-natural peanut butter. Perfect for grabbing on the go. Hard-boiled eggs with fruit — Put a hard-boiled egg and a piece of fruit such as an apple or pear in a zip-closed bag. This is a great snack for kids since it isn’t messy and adds protein and fiber to the diet. Ricotta dip — Mix 1 cup of ricotta cheese with fresh dill, minced garlic and season with salt and pepper. Enjoy on crunchy veggies or with whole grain crackers. Avocado slices with olive oil, lime and sea salt — Cut a small avocado in half and remove the pit. Slice and drizzle with extra-virgin olive oil, fresh lime juice and sprinkle with sea salt. Chips and salsa — Portion fresh or store-bought salsa into airtight containers and serving sizes of healthy whole grain or all-natural tortilla chips into bags. Banana bread with peanut butter — Bake up a fresh homemade loaf of banana bread and top it off with all-natural peanut butter. This is a filling snack that also packs a good serving of protein from the peanut butter. Ham and cheese roll-ups — Make a stop at your local deli and have them slice your favorite ham and cheeses. Take one slice of ham and one slice of cheese and roll up together. Store in a plastic zip-closed bag or airtight container for a quick low-carb snack. Healthy tuna salad — Prepare homemade tuna salad using 1 can of water-packed tuna, drained, 1 tablespoon low-fat mayonnaise or Greek yogurt and season with salt and pepper. Serve with celery sticks for dipping. Strawberry bagel sandwich — Spread a whole grain bagel with low-fat cream cheese, sliced strawberries and drizzle with agave nectar or honey for a snack that satisfies your sweet tooth. Rice cakes with hazelnut butter — Spread rice cakes with hazelnut butter and sprinkle with granola. Wrap in plastic wrap and toss it in your gym bag, purse or lunchbox for a rich and crunchy snack. Stuffed tomato halves — Halve tomatoes and remove the seeds. Fill the tomatoes with a mixture of ricotta cheese and dried Italian herbs. They will keep well if stored in an airtight container and are great when you crave something light but savory. Make these bite-size by using large cherry tomatoes. Soy-glazed edamame — Prepare a bag of edamame as directed on the package. Add the edamame to a large pan and lightly saute with 1/4 cup of low-sodium soy sauce, crushed garlic, 2 tablespoons of honey and season with salt and pepper. Cook until the edamame are coated and allow to cool. Egg salad and veggies — Make a simple homemade egg salad by substituting Greek yogurt for mayonnaise and serve it with sliced veggies or whole grain crackers. 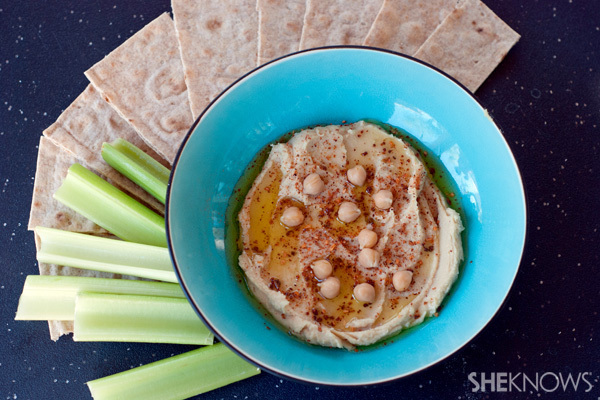 Hummus makes a great snack for adults and kids. It’s a wonderful way to incorporate veggies into snack time, plus the hummus adds protein and fiber since its base is made from garbanzo beans. In a food processor add all of the ingredients. Add in 1/4 of the reserved liquid from the garbanzo beans and blend on high until the mixture is very smooth and creamy. Pour the hummus into a serving bowl and garnish with extra garbanzo beans (optional), a drizzle of olive or extra spices. Store in an airtight container until ready to eat. Serve with fresh vegetables and pita bread. This is a wonderful and filling snack that holds up great when making ahead. It can double as a snack or as a healthy light lunch full of veggies. In a bowl, combine the cottage cheese and ranch powder, mixing well. Divide the cottage cheese and the vegetables between two airtight containers and top each container with the lid. Keep chilled until ready to eat. This easy dish doubles as a healthy snack or a healthy breakfast. You can make these parfaits a couple days ahead and keep them in the refrigerator. Spoon Greek yogurt into the bottom of the Mason jars. Add a layer of fruit and spoon more yogurt on top. Repeat until you have filled the jar. 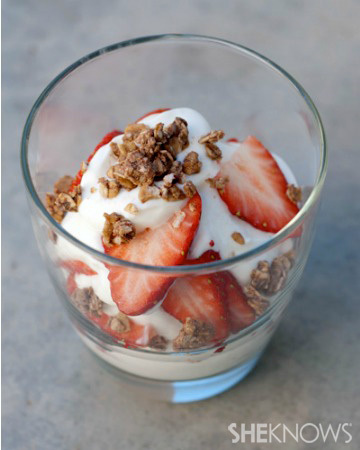 Garnish with granola, nuts or honey. Place the lids on the jar and keep chilled until ready to eat.